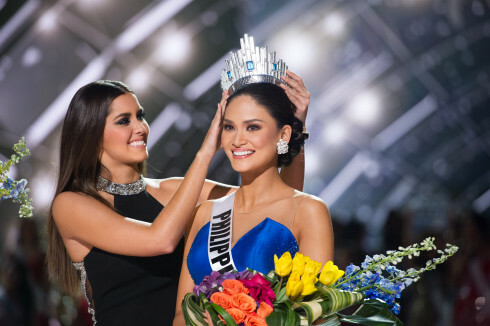 Miss Philippines Pia Alonzo Wurtzbach was gloriously crowned Miss Universe 2015 in the coronation night held at The AXIS in Las Vegas, Nevada, United States on Sunday, December 20, 2015 (December 21 8:00 am in the Philippines). 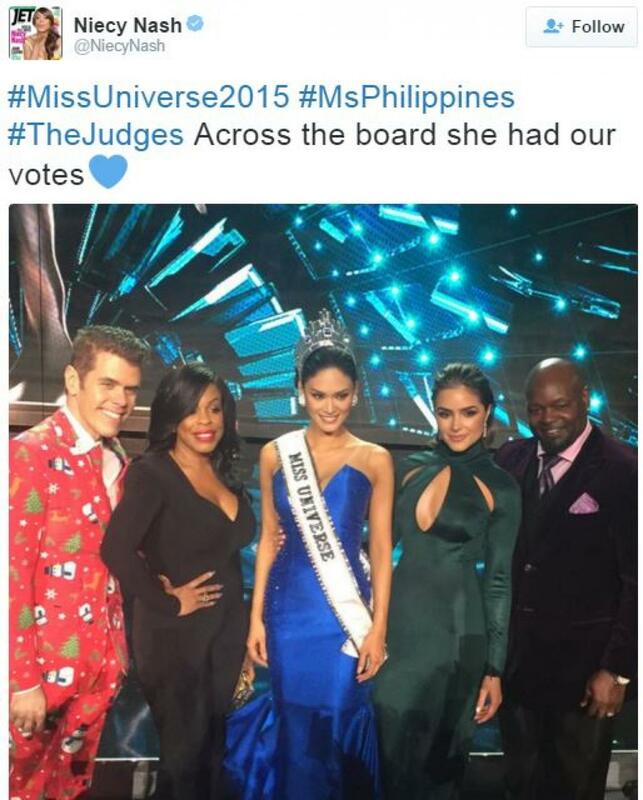 Wurtzbach bested other 79 contestants from across the globe. Miss Colombia Ariadna Gutierrez won as 1st runner-up, while Miss USA Olivia Jordan clinched the 2nd runner-up spot. Miss Universe 2014 Paulina Vega of Colombia crowned her new successor. 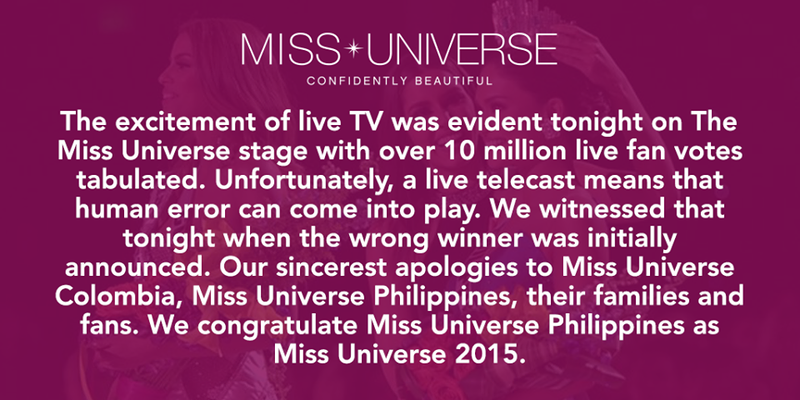 This is the 3rd time Philippines has won the Miss Universe crown since its 42-year drought. 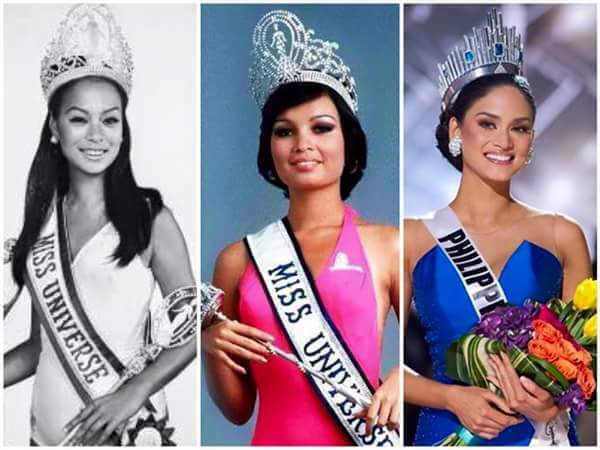 Philippines won the crown first in 1969 (Gloria Diaz) and second in 1973 (Margie Moran). 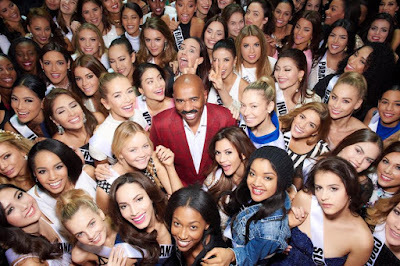 Hosted by Steve Harvey, this is the 64th edition of the Miss Universe pageant carrying the theme, "Confidently Beautiful." Roselyn Sánchez served as the backstage correspondent. 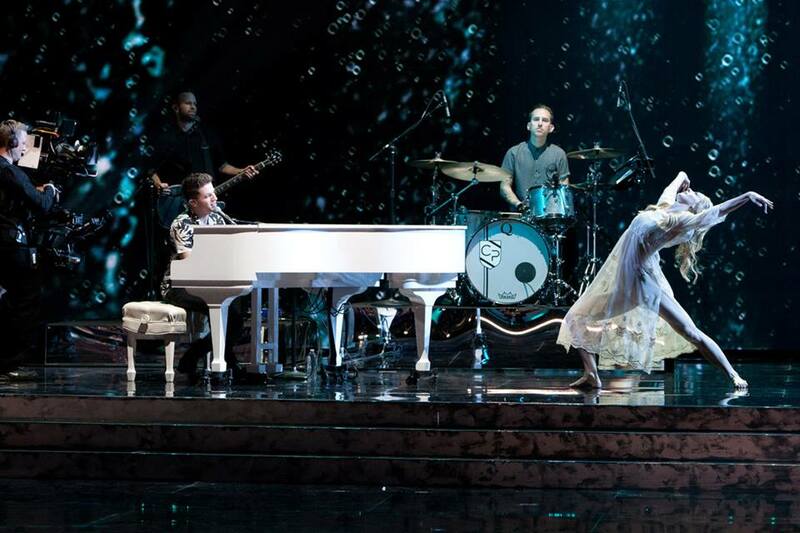 The coronation night also featured live performances of Charlie Puth, The Band Perry and Seal. The telecast judging panel was composed of Emmy Award-nominated actress Niecy Nash (SCREAM QUEENS, “Getting On”), celebrity entertainment mogul Perez Hilton, Miss Universe 2012 Olivia Culpo (USA) and football legend Emmitt Smith. 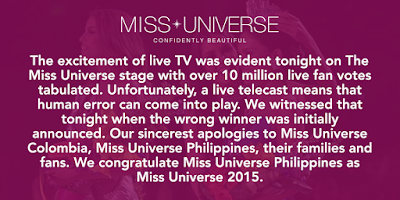 For the first time ever, fans worldwide had a chance to vote for their favorite candidate who they thought deserving of the Miss Universe crown. With a virtual seat at the judging table (online votes are treated as the 5th judge), viewers voted on each contestant on a scale of one to ten in swimsuit, evening gown, and interview. 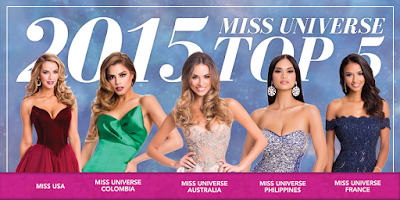 Voted was done via www.MISSUNIVERSE.com/vote using any desktop or mobile device during the live telecast. 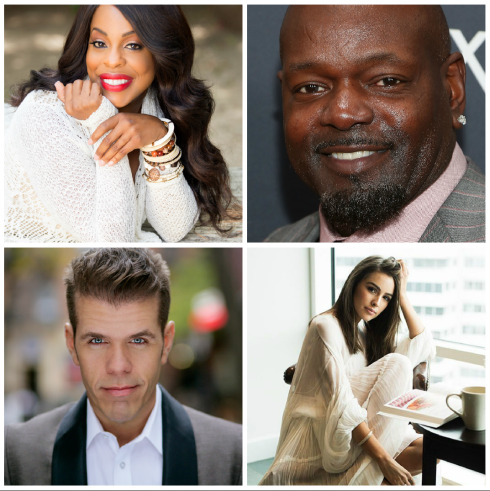 The rest of the 77 contestants were the 6th judge. 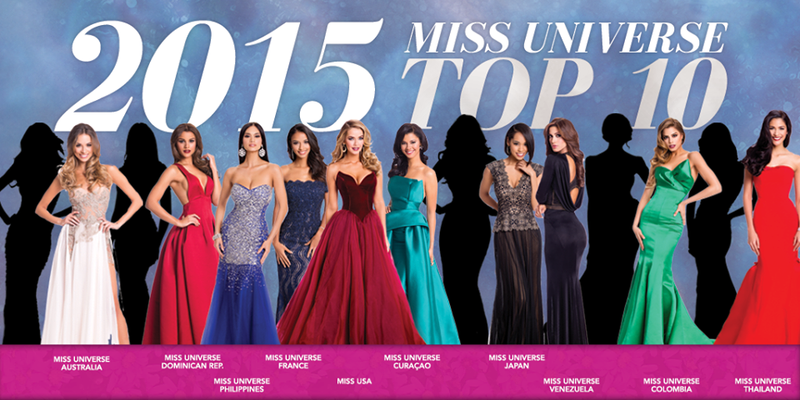 They voted backstage and chose who among the Top 3 should be Miss Universe 2015. 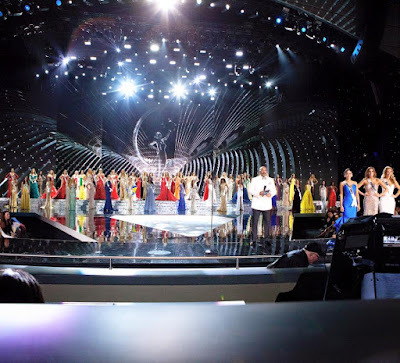 It's amazing to see the Philippine flags being waved at the audience while the Top 3 women were having their final look/ walk on stage. Seal performed one song for each contestant. In the giant LED screen background was shown the candidate's photo designed in broken glass/ mirror. Wow! "Do you think the United States should have a military presence in your country?" "Having experienced terrorism first-hand, what is the best way for the government to combat this rising threat?" "Australia is taking its first steps towards legalizing marijuana. Do you think that's a good idea and why?" "Drug abuse is a serious social problem. What is the best way to handle this issue?" "Few issues in the United States are more polarizing than gun ownership, what's your position on gun control?" Professional actress who has appeared in television and film. USA reached Final 15 for 59th time in 64 years; 51st Final 10 in 64 years (most of any country has reached); advanced to 36th Final 5 (#1 record). 3-time national champion volleyball player. Only 2 countries have made it in the Final 10 more than Colombia - USA & Venezuela. 1st bi-racial woman to repesent her country in Miss Universe. Japan moved into its 1st Final 15 since 2008; 1st Final 10 since the country won in 2007. Studying social administration with plans to be social worker. Thailand moved into 1st Final 15 since 2007; 1st Final 10 since 1988. Her family fled to Bosnia & Herzegovina during the Yugoslavian war. Advanced to 7th Final 10 in 8 years and 15th time to advance to Final 10 in history; moved into 12th Final 5 (4th time in 6 years). Moved to USA at 15, bullied for looking different. Dominican Republic advanced to its 9th Final 15 and 9th Final 10 this year. Recently earned a degree in international trade. France reached its Final 15 for 6th time in 7 years; 10th Final 10 this year; has moved into Final 5 only once in the 9 previous Final 10s; Won in the only and previous Final 5 (1953). Studying biology and science, aspires to be a clinical chemical analyst. Curacao advanced to Final 15 and Final 10 for the 1st time since 1997. Growing up, supported her mom & sister with money earned from acting. Philippines advanced to Final 15 for 19th time; advanced to 6th straight Final 10; reached 12th Final 5 in history. 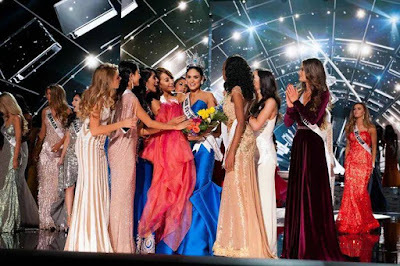 Venezuela made its Final 15 for 41st time (2nd to USA); made it to 36th Final 10 (2nd to USA); only country to have back-to-back winners in Miss Universe (2008 & 2009). After the Top 10 finalists ramped on stage with their evening gown, Miss Universe Slovenia Ana Haložan was given the chance to walk on stage with her evening gown. She was honored in an emotional tribute demonstrating her strength and determination throughout her journey. Halozan suffered an accident when she arrived in Las Vegas, which resulted in hospitalization, preventing her from participating in registration activities, interviews and pictorials. The right side of her face became paralyzed. She was not present at the first official events but stayed in Las Vegas until the pageant was over. Halozan was supposed to be the 81st candidate but was not allowed to continue anymore due to her condition. I hope that Miss Slovenia Ana Haložan will recover soon and can/will still compete again internationally. Beligium advanced to 1st Final 15 since 2010. Brazil moved into its 34th Final 15, trailing only USA & Venezuela. Indonesia made into the Final 15 for 3rd straight year. Mexico made into the Final 15 for 8th time in 12 years. South Africa reached the Final 15 for 11th time since 1998. 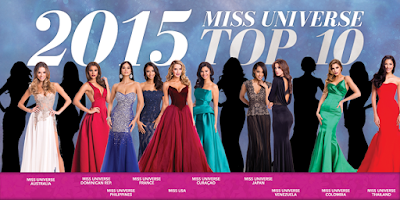 Tallest Candidate: Miss Belgium Annelies Toros - 6'1"
Shortest Candidate: Miss Hungary Nikoletta Nagy - 5'5"
Oldest Candidates: Miss USA Olivia Jordan & Miss Cayman Islands Tonie Chislom - both age 27. Youngest Candidates: Miss Albania Megi Luka, Miss Curacao Kanisha Sluis, Miss Gabon Ornella Obone, Miss Israel Avigail Alfatov, Miss Russia Vladislava Evtushenko, Miss Serbia Daša Radosavljević, and Miss Uruguay Bianca Sánchez - ALL age 19. Most wins in Miss Universe 64-year history: USA - 8 times (1954, 1956, 1960, 1967, 1980, 1995, 1997, 2012); Venezuela - 7 times (1979, 1981, 1986, 1996, 2008, 2009, 2013); Puerto Rico - 5 times (1970, 1985, 1993, 2001, 2006); Sweden - 3 times (1955, 1966, 1984); and Philippines - 3 times (1969, 1973, 2015). Countries that withdrew this 2015: Egypt, Ethiopia, Guam, Kazakhstan, Kenya, Lithuania, Slovenia, Sri Lanka, St. Lucia, Switzerland, Trinidad & Tobago, and Turks & Caicos. Countries that returned this 2015: Cayman Islands, Denmark, Montenegro, and Vietnam.